Victor wanted you to know that this part is inspired by this Zelda rumor that he really wanted to believe in and was excited about as a younger Victor, but it didn’t come true. He also wanted the bucket to look like a totally boring bucket, otherwise I kinda wanted to make it look like the bucket from Banjo-Kazooie (Leaky) minus the googly eyes. Anyway. I’m more excited about the next page than I’ve been about any page in a long time, so stay tuned!! Have a good weekend. Be on Smash tonight (Friday) and I’ll make some rooms. Fight Blank! Fight Derk! Fight Cyril?! Fight Toon Link and Lucario and the Koopalings when I want to be more serious (as far as I go there, which isn’t very). 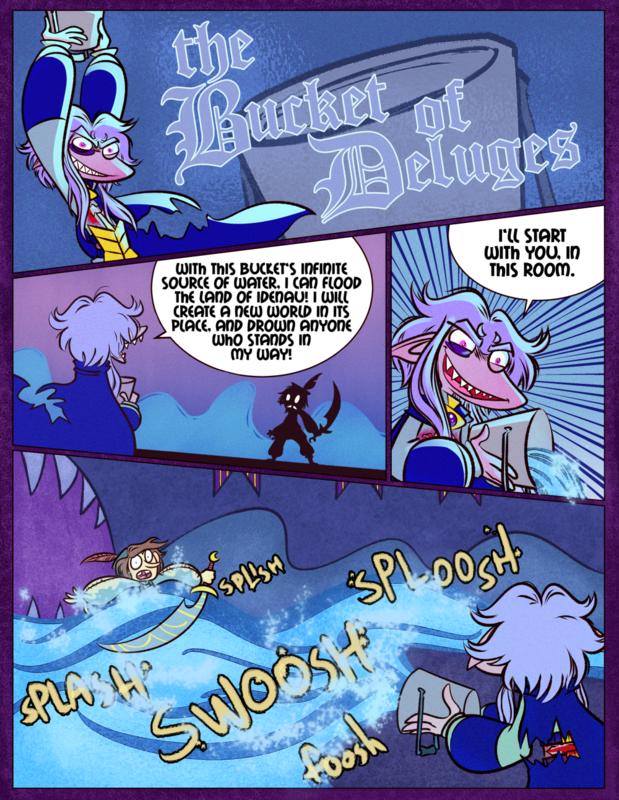 Luckily, his castle already has the requisite water-themed decor to become a dungeon! Hopefully he has stocked up on floating platforms and sluice gates. HE WAS ARCHIE FROM TEAM AQUA ALL ALONG. IT MAKES SENSE. This is officially my favorite page. I have no idea why, I just love it. Decanter of Endless Water is a super powerful item. I wonder if Skärva’s going to summon his spare cape while Blank’s swimming? My favorite idea for a Zelda game was just that. This is not at all what I was expecting and hoping for. But hey, it made me giggle for several minutes. Since the Bucket is the focal point in that first panel, you really ought to not have it be cut off by the top of the panel. You’re right. I’ll see if I can’t move Skarvs down a bit tonight. Thanks! Tries not to make a Minecraft reference, but fails. tries to be the first one to make a minecraft reference, but fails. But heroes can’t swim! Skarva you monster! Even worse if he hasn’t given Blank the chance to get a water tunic! He is the water bearer! This is the dawning of the age of Aquarius! But really, “deluge” is one of my favorite words. DOES SKARVA’S EVIL KNOW NO BOUNDS?! Finally reading again after some “unexpected life things” and this bucket and plan are… really awesome. It’s a simple but cool artifact with ridiculous powers and a plan that would feel fitting in an actual nintendo game (in fact minus the bucket it is sorta the third gen pokemon plot). Makes me wonder what all his other plots have been. Hey there Purps! I hope your life is going ok! Unexpected life things can be fun but tend to be very much not so. It’s the latter but things are getting better. Hoping it ends up being a “Iron forged through fire” type of ordeal.